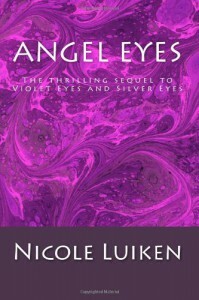 This is the third book in the series that began with Violet Eyes and Silver Eyes. Each of the books stands alone in terms of plot (I started with Silver Eyes, book two), but not in terms of character or worldbuilding. The plots involve claustrophobic battles of wits as Angel and Mike, genetically engineered superhumans, figure out the puzzles set up by their antagonists and end up one step ahead of them by figuring out their intentions as well. The first two books were published by Simon and Schuster, but they must have dropped the series as, after a long gap, Angel Eyes was self-published. Unlike the other two books, it included Mike's point of view as well as Angel's. This allowed for some interesting effects, such as the tense gap between Mike getting the information that would let Angel figure out who the bad guy is and Angel getting that information. It also allowed Mike to have more of a character arc. However, it also lessened the intensity and tautness by comparison to previous books, where we were stuck in Angel's point of view as she tried to figure things out. While the multiple points of view worked really well with the plot of Angel Eyes, I felt that this meant it was missing something by comparison to the other two books. 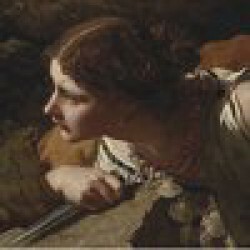 Another problem was that the stakes were lower- in previous books they were playing for identity, sanity, memory, and all sort of existential stakes. Here, they're fighting for their lives, and even the introduction of clones and VR doesn't bring the identity issues to the same level as the other two books. Generally, I thought it would have benefited from professional editing, but I would rather have a self-published sequel than none. There were also many positive elements. I really liked revisiting some of the secondary characters from Violet Eyes, such as Angel's rich friend Maryanne, fighting to prove herself, and Angel and Mike's rivals/fellow superhumans Leona and Vincent, who share an intense but platonic bond. The puzzles were clever and I enjoyed watching Angel beat the system and help others do the same. Also, the lower stakes made sense in that part of the plot is about Mike and Angel's relationship. Having endured serious traumas before, can they deal with the day-to-day stressors of different career choices, suspicions of cheating, and lengthy separations? It's not a surprise that they can, but it explains the different focus of the story. The pacing is fantastic- I finished it in 24 hours and was in suspense the whole time. It also ties together the two previous books, which were very different in their settings. Finally, the secondary characters had plenty of surprises and one who had seemed villainous turns out to be an interesting character dealing with a tough situation. -and emphasis on the unfairness of a system of debt peonage, the ultimate message is way more complicated than that. Especially since Angel shows quite a bit of altruism. Apparently there might be a fourth book and if so, I hope be get more Leona and Vincent, as they fascinate me and I was happy to see them again in this book. If you read and liked the previous books and want more Angel and Mike, read this. If you haven't read the others, try Violet Eyes, which is a suspenseful, creepy, wonderfully intense little novel.